A wide view of the Security Council. The United Nations Security Council has strongly condemned the Democratic People's Republic of Korea's (DPRK) nuclear test on 9 September and said it is a clear violation of repeated calls on the country to halt such activity. In a press statement issued late yesterday evening, after the Council held urgent consultations on the situation, the 15-member body underlined that the test is a clear violation and "in flagrant disregard" of Security Council resolutions 1718 (2006), 1874 (2009), 2087 (2013), 2094 (2013) and 2270 (2016), as well as of the non-proliferation regime. “Therefore a clear threat to international peace and security continues to exist,” the statement said. Furthermore, members the Council also recalled that they had previously expressed their determination to take further significant measures in the event of another DPRK nuclear test. “In line with this commitment and the gravity of this violation, the members of the Security Council will begin to work immediately on appropriate measures under Article 41 in a Security Council resolution,” said the statement. 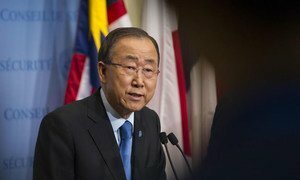 Strongly condemning another underground nuclear test by the Democratic People’s Republic of Korea (DPRK), United Nations Secretary-General, Ban Ki-moon reiterated his call on the leadership of the country to reverse its course and commit to a path of denuclearization.